As gardeners, we are intimately acquainted with “weeds”, and with other pests that prey upon our vegetables, fruits and flowers. Mild mannered back yard gardeners can become militants as we seek to save our beloved plants from depredation. But even the most forceful among us rarely approach the hyperbole that is reserved for “invasive species”. As a 2005 Federal report put it, “America is under siege by invasive species. (They are) the single most formidable threat of natural disaster of the 21st century”. The idea that our pristine “native” landscapes are at risk of being laid waste by alien invaders has created an unlikely set of alliances between and among well regarded environmental groups, local naturalists, representatives of the chemical industry, and agricultural groups. Even organic enthusiasts can be persuaded to tolerate the widespread application of glyphosphate and 2,4 D, together with slashing, bull dozing and burning, all in the name of “saving” our native environments. These invasive plants are so tough, so unrelenting, and so dangerous that extreme measures must be applied. Or so we are told. But what if that is completely wrong? What if our “war on invasives” blinds us to the real dangers we face in confronting climate change and the long term effects of industrial and agricultural pollution? What if we are actually harming native species in trying to save them? What if we are ignoring the very real restorative ecological and economic properties of the plants we seek to destroy, using methods that will inevitably fail? Both Scott and Orion agree that the “war on invasives” is misguided, harmful, and ultimately doomed to failure. Scott paints his arguments with a broad brush, emphasizing the intersection of economic interests represented by big agriculture, big industry and corporate dominated government. Aided by the view that man could and should dominate and subdue his environment, these interests pursue the war on invasives to their own profit. Even the softer view that it is important to maintain pristine areas where we may enjoy “nature” serves the profiteers, since it guarantees the acquiescence of groups dedicated to preservation. Thus we have demonized plants that are adapted to the very disruptions we have imposed on the landscape, and overlook the sources of our own salvation. 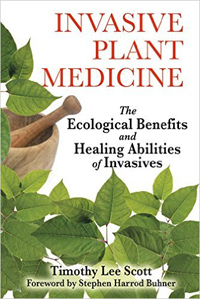 Half of Scott’s book is dedicated to the often ignored healing properties of invasives, including plant by plant descriptions of beneficial usages by Traditional Chinese Medicine, Ayurvedic Medicine, and Traditional Western Botanical Medicine. Antimicrobial, antioxidant, anticancer and anti-inflammatory properties characterize these plants, many of them harvested and used for centuries before scientists “discovered” them. Scott carefully details what we know about how these plants are harvested and used, including dosages and contraindications, and covers the somewhat limited scientific studies of each. One example is the much maligned Japanese Knotweed. As Scott notes, this is truly a “warrior plant”. In its native Japan, it is the pioneer plant of volcanic areas, and it predominates for generations before conditions allow other succession plants to flourish. It is tough to harvest, with thick roots, any piece of which can reestablish the plant in almost any soil conditions. But knotweed is also a cleansing plant that removes pollutants, contains resveratrol, the antioxidant of red wine, is effective against Lyme disease, and is being researched for possible prevention and treatment of Alzheimer’s Disease. We seek to eliminate such plants at our peril. Tao Orion’s very readable book benefits from both her academic training and her extensive experience as a permaculture designer and restoration planner. 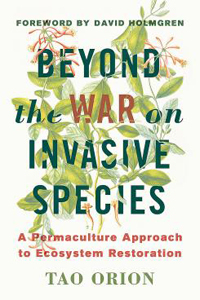 The sheer range of her expertise is impressive, and her important book is informed by a multitude of case studies of (mostly failed) attempts to control invasive species, mostly with the active involvement of conservationists and mostly on public land. Orion’s analysis of the corporate origins of the “war on invasives” and the limitations of the traditional view that humans dominate and manage the environment, presumably in a state of balance, track those of Scott. But it is her use of the concept of permaculture, also noted by Scott that gives the book its organizing theme and much of its analytic power. It is a mistake, she argues, to view invasive species outside of the ecological systems in which they live. All evolution should be understood as a consequence of “invasions”, many arising from human intervention in their environments. These interventions range from the prehistoric (one of the most interesting chapters of the book describes the pre-Columbian world in which early peoples gardened the landscape in a sustainable way), to the agricultural revolution, to the industrial revolution and associated pollution and carbon induced climate change. Invasive species, Orion maintains, are simply those which are able to grow and reproduce in the disrupted environments available to them. Invasives are a symptom of disruption rather than the cause. Garlic mustard can thrive where native plants can no longer survive. And destroying the garlic mustard, especially destroying it by herbicide and bull dozer, won’t help the embattled natives, and more likely will eliminate those that remain in the area. We still may (and should) want to save that native plant. But we will have to do it by methods more complex than simply targeting the invasive interloper. We will have to understand the factors that facilitate the survival of the new invasive, and grasp the role that the new species plays in the changing ecosystem. In that way, we can make use of its virtues, whether medicinal, as biomass, as a remediator of heavy metal pollution, in carbon sequestration, as a pollinator, and/or as shelter for local animals and insects. In making use of the new species, we also limit their growth, save niche areas for beloved natives, create new products and jobs, and maintain communities of both plants and peoples. And perhaps, we will have acted to limit the march of climate change, and preserve the world that we ourselves evolved to live in. Orion’s book moves from case study to utopian vision. At each level, it is informative, persuasive and thought provoking. Restoration advocates will profit from Orion’s detailed case studies. Public land managers and political activists will find much that is of use as well. And small scale landowners and farmers will be able to use her practical information to help manage their own “problem species” without environmental destruction. Finally, Orion’s broader vision of a society informed by the ethics of permaculture is compelling, if perhaps elusive. Her book deserves a wide audience.